Steponas Kairys (21 December 1878 to 16 December 1964) (another surname is Tumasonis, in the USA – J. Kaminskas. Pseudonyms: Viktor, Marjan, Dagilis, Dėdė (i. e. “Uncle”), Kugis-Mugis, Raulas Kemeklis and others) was Lithuanian political and public figure, Chairman of the Supreme Lithuanian Liberation Committee, engineer, professor, Signatory of the Lithuanian Independence Act. He died in Brooklyn, New York; reburied on 19 July 1996 in Kaunas, at the Petrašiūnai Cemetery. Steponas Kairys was born in Užunvėžiai, baptized in the Kurliai Church, secretly taught at home, later attended the Palanga Progymnasium and then a gymnasium in Šiauliai. Already at the gymnasium, S. Kairys was a social activist. He was secretly studying Lithuanian language, handling a secret school gymnasium library, encouraging reading Lithuanian letters, participating in student rebellion against forced attendance of Orthodox services, and writing proclamations. In 1898, he entered the Institute of Technology in St. Petersburg (Russia) and graduated from it with honours and an engineer’s qualification only ten years later due to his active anti-political activities. 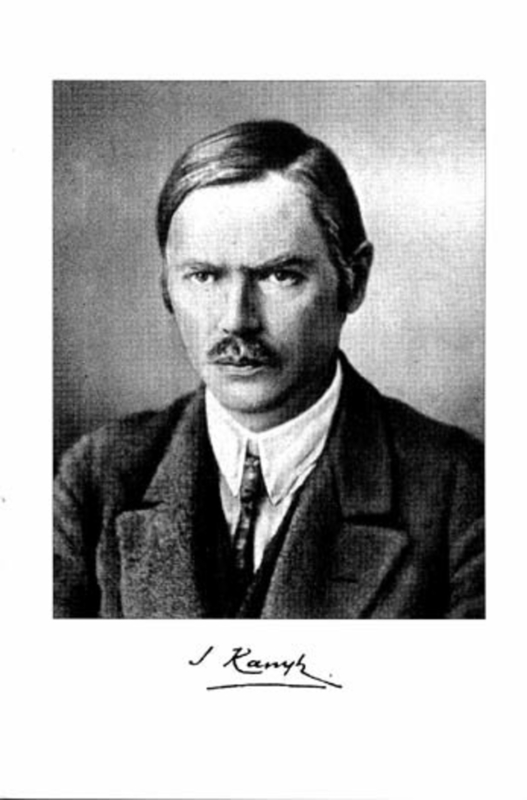 During his studies in St. Petersburg, S. Kairys also wrote several prose works. S. Kairys was signing his works and publications as Viktor, Marjan, Dagilis, Dėdė, Kugis-Mugis, Raulas Kemeklis and other pseudonyms. Since 1900, S. Kairys was a member of the Lithuanian Social Democratic Party (LSDP) in Vilnius. During the summer holidays, he was engaged in conspiracy activities in Vilnius. In 1901, he was elected a member of the LSDP Centre Committee and held the post until 1944. In 1904, together with A. Domaševičius he wrote a manifesto of the LSDP Centre Committee, which outlined the LSDP’s ambition to create an independent democratic Lithuania. At his initiative, the Party was named the Lithuanian Social Democratic Party in 1905. He was a secretary of the Lithuanian Congress that took place in Vilnius on 4 and 5 December 1905 and was elected a Vice-Chairman of the Great Vilnius Seimas. In 1907, S. Kairys participated in the elections of the Second State Duma (i. e. Parliament) and was appointed a secretary of the LSDP parliamentary party to handle all the party’s correspondence and write speeches. He worked until the Duma was dismissed on 17 June 1907. In the period from 1908 to 1912, like most Lithuanian graduates in engineering, S. Kairys worked in Russia: first in Samara, building bridges on the Volga-Bugulma railroad with Petras Vileišis, later in Melekess, and then in the Kursk governorate. Upon returning to Lithuania (1912–1916), S. Kairys worked at the municipal water supply and sewerage department in Vilnius, where he headed water supply and sewerage laying works and was the first to start the construction of the canal on the Didžioji Street. In 1915, together with Antanas Smetona, Jurgis Šaulius, Jonas Basanavičius, Petras Klimas and J. Stankevičius, S. Kairys founded the Lithuanian Defence Forces Group. On 10 June 1916, he signed two memoranda to the General Ludendorff on the development of Lithuanian national spirit and about the aspirations of Lithuania. In the period from 30 June to 4 July 1916, he participated at the congress of nations subjugated by Russia in Lausanne, where it was decided to seek independence of Lithuania. He was the organizer of the Vilnius Conference that took place on 18 to 22 August 1917 and was elected a Vice-Chairman of the Council of Lithuania of the said conference. In December of the same year, he signed a protocol on the conditions for the restoration of Lithuania’s Independence along with the Minister of Foreign Affairs of Germany. Together with other members of the Council, S. Kairys signed the Lithuania Independence Act of 16 February 1918. Later he withdrew from the Council as he disagreed with the proposal to invite Urach to be the King of Lithuania and worked as the editor of the weekly newspapers “Darbas balsas” and “Socialdemokratas” for some time. In the middle of December 1918, he founded the Utena County Municipality, was elected chairman of this county council; however, after one week, when Utena was taken over by the Russian Army (the Pskov Riflemen Division), he left to Kaunas. Despite the difficult political environment, he contributed to the work of the government of Mykolas Šleževičius (1919), the founding of the scout association, and became a member of the Masonic lodge “Lithuania” (1920). He had been elected to the Seimas as a representative of the Lithuanian Social Democratic Party, and distinguished himself in the Seimas as a principled defender of democracy. On 17 December 1926, during the coup d’état, S. Kairys was arrested and held in the General Staff, where he was the only one voting against the compulsory retirement of M. Sleževičius’ government. In 1929, for articles published in the “Socialdemokratas” newspaper its editor S. Kairys was sentenced to two weeks in prison. The author and signatory of the Independence Act spent the day of 16 February in the Kaunas heavy labour prison. In the period from 1923 to 1938, S. Kairys was the head of the sewerage and water supply department of the Kaunas City Municipality, and worked at Davydas Grovė’s firm in Berlin for half a year. He prepared a project for Kaunas water supply and sewerage system and a financial plan to avoid foreign loans and concessions that would be detrimental for the population. He has also prepared projects for Šančiai and Žaliakalnis. In addition, he prepared a water supply and sewerage project for Šiauliai, was an expert in preparing projects for Marijampolė, Vilkaviškis, and Panevėžys. In the period from 1923 to 1943, he was a lecturer at Kaunas Vytautas Magnus University, and later became the University’s dean. In 1940, S. Kairys was awarded the title of honorary doctorate of Kaunas Vytautas Magnus University for the construction of sanitary facilities. In the Independent Lithuania, he supported the desire of the people of his hometown Užunvėžiai to receive education. In 1939, he personally allocated eight thousand Litas for the construction of a new building for Užunvėžiai School. In the period from 1943 to 1945, he was a chairman of the All-Lithuania Liberation Committee. In 1943, the German Occupation Government arrested him along with other members of the Senate of Kaunas Vytautas Magnus University for three days for standing against enrolment of students to the Reich Labour Service. As he travelled to the West bearing the identity documents of the deceased farmer Juozas Kaminskas, S. Kairys was arrested and sentenced to two years in Liepaja (Latvia). Since 1945, he lived in Germany, where he again took an active part in the activities of the LSDP. As of October 1951 and until the end of his life, S. Kairys lived in the United States as Juozas Kaminskas. During the European Socialist Conference that took place in in Brussels (Belgium) in February 1954 a letter of S. Kairys was read, in which he expressed the wish of the LSDP not to recognise the incorporation of Lithuania into the Soviet Union and deem it an act of violence. While living in the United States, S. Kairys publicly expressed his hopes and opinion that an oppositional spirit would rise in Lithuania and, therefore, contacts with the people of Lithuania should not be avoided. Steponas Kairys ceased political and social activities when his health started to deteriorate. In 1960, he settled in Smithtown, New York State, where he remained until the end of his life. The village name comes from the Nevėžis Stream. It is told that a landlord gambled away the land, “the field outside Nevėžis”. Later, the territory located a village named as Ažunevėžiai in a local dialect, that is Užunvėžiai. In 1744, the village of Užunvėžiai was mentioned in the lists of Vilnius Episcopate Synod as belonging to the Skiemoniai Parish. In the 19th century, Užunvėžiai was the seat of a small Reutai family estate, which was reduced after the abolition of servage down to only a bit over 100 ha of land. By the end of 19th century, the estate homestead went into decline. In the end of 19th century and the beginning of the 20th century, the following craftsmen lived and worked in the village: a fur-worker Archipas, a tailor Kazys Katinas, shoemakers Beinaravičius and Milevičius, and a god carver Petras Čivas. In 1920, there was a primary school established in the village, which operated until 1940. The furniture was made by the parents of the schoolchildren. At the time, the first teacher Ona Tutkutė-Puodžiūnienė was teaching 62 pupils at the school. In the period from 1939 to 1940, a typical masonry school building was erected. Steponas Kairys, an engineer, donated 8,000 Litas, the whole bonus he had received in Kaunas, to construct the school. At that time, 55 children studied in grades I to IV. There was a hiding place in the school, where the defenders of freedom had been hiding until the year of 1950, for which the schoolmaster Marija Morkūnienė (1943-1950) was arrested and imprisoned. 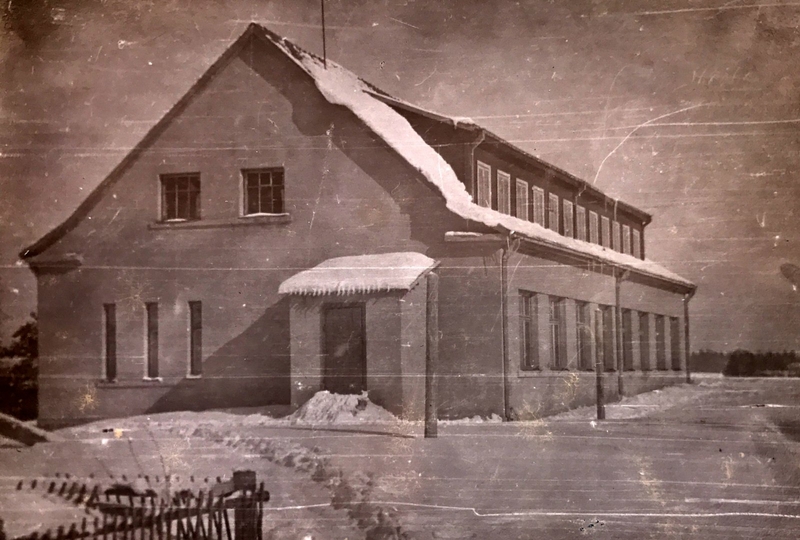 In 1953, the Primary School of Užunvėžiai was reorganised into a seven-year school, with almost 100 pupils attending and 10 teachers working here. In the period from 1962 to 1969, the school was operating as an eight-year school. In the period from 1953 to 1969, the principal of this school was Jonas Kukta. His initiative at the school was to promote activities of drama lovers. After the school was closed, in 1975, a library and shop were operating in the building for some time, then it was left unused and abandoned. Currently, the historic building of the school is under the protection of the Nevėža villages’ community. At the initiative of former schoolchildren and teachers, a wooden memorial board reminding a crumpled sheet of paper with a school note “Užunevėžis / School 1940–1975 ...” (the author is sculptor Saulius Milašius, 2017) was affixed to the historic school building. On 13 August 1950, a group of MIA soldiers surrounded the partisan brothers Balys Lasys-Darius and Jonas Lasys-Girėnas at the Užunvėžiai School. In the period from 1948 to 1950, the brothers had been hiding in a bunker located there, yet they were betrayed. During the shooting, the freedom defenders were killed. Five of the Užunvėžiai residents were deported to Siberia after the Second World War. In 1949, the village was joined with “Žvaigždė” collective farm, and later belonged to “Tiesa“, “Aušra”, “Nevėžis” collective farms, until the farm went into decline in 1991. Currently, Užunvėžiai holds the largest dairy farm of Vytautas Šablauskas (60 ha) and there are several smaller private farms. At the moment, Užunvėžiai is the centre of Užunvėžiai Parish of Ukmergė Deanery of Kaunas Episcopate. In the period from 1937 to1940, the Blessed Virgin Mary Church was built in the village at the initiate of the priest Steponas Telksnys. The Virgin Mary Church was designed by the architect Karolis Reisonas (1894–1981), the author of the project of the Christ’s Resurrection Church in Kaunas. Its construction began on 10 July 1938, when the pastor of Kurkliai and the chairman of the construction committee Steponas Telksnys sanctified the foundation of the future church. 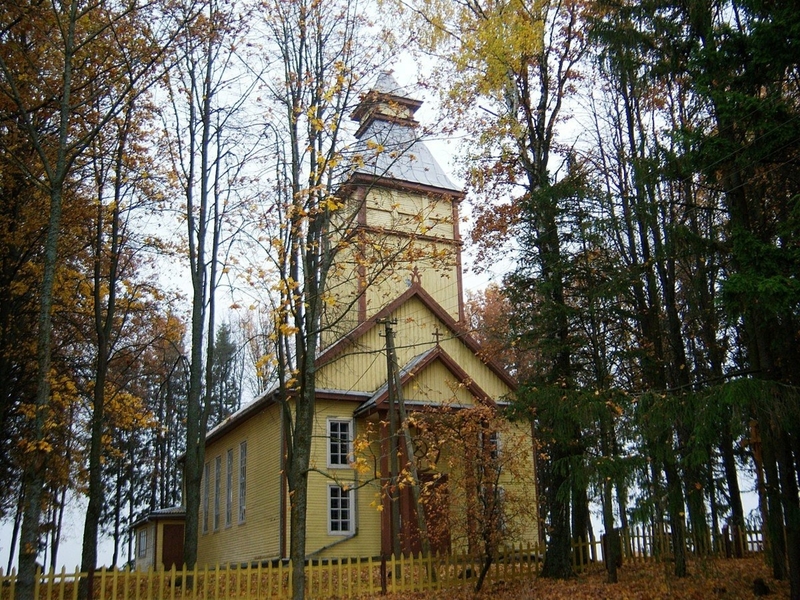 The church construction was supported by the Banėnai brothers and Uršulė Banėnaitė-Kisielienė, who donated the land (her farm) to their parish. The yet unfinished church building was sanctified by Juozas Katinas, the pastor of Kurkliai, on 18 August 1940. Near the church, at the intersection of the road, there is a new cemetery of 30 ares. The cemetery was the last home of the defenders of freedom, who died during the post-war years. Their grave is marked by a stone monument, a stela with an original iron cross and the inscriptions: “Killed for / Lithuanian / Freedom” and “Bronius Masiulis / 1919–1944 / Henrikas Kukta / 1923–1944 / Bronius Kukta / 1918–1944 / Simonas Nečiūnas / 1920–1946”. Užunvėžiai is the homeland of Steponas Kairys, where his place of birth is marked with the signatory’s memorial mark and a roadside wooden post with an ornamental roof with carved inscriptions reading: “My native village / fit to be a small image of the entire / Highlands (...) Fit / to be taken/ in the handfuls of M. Čiurlionis’ kings / Steponas Kairys” and “Here in the former farmstead / 2 January 1879, the public official, professor, Signatory of Lithuanian / Independence Act / Steponas Kairys /was born./ He died in New York on 16 December 1964”, the author of the wooden post was Jonas Tvardauskas, 1992.